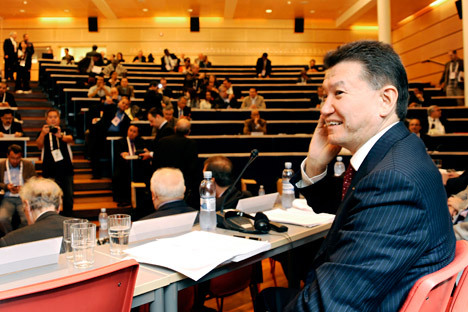 World Chess Federation (FIDE) President Kirsan Ilyumzhinov will file a lawsuit against the U.S. Treasury Department in response to sanctions imposed on him over accusations of cooperating with the Syrian leadership. "My complaints against the U.S. Treasury Department because of the sanctions imposed on me were registered on February 23. Under American legislation, within 90 days I was supposed to answer a number of questions linked with the accusations made against me and alleging cooperation with the leadership of Syria and, in particular, the head of this country Bashar al-Assad," Ilyumzhinov told Interfax on May 24. "I provided all information in response to all questions, including those concerning my movements from 2010 to 2015, and, on the basis of U.S. law, I was supposed to receive documents from the U.S. Treasury Department explaining on what basis these accusations had been made against me. These 90 days expired yesterday, on May 23, but I have not received any answers and explanations from the U.S. Treasury Department," he said. "Moreover, a month ago I told the American side that I could answer their questions during a lie detector test, but I have not received any reply," Ilyumzhinov said. "Consequently, today I am forwarding materials to a court in Washington DC, where the U.S. Treasury Department is registered, for them to be considered by a court of law," the FIDE president said.